Think beautifully grilled meals are a luxury reserved for suburban decks on sunny days? Think again. Even if you have the world’s tiniest apartment patio, live in the rainiest city, or the thought of firing up a grill freaks you out…there’s hope. It’s possible to make excellent grilled meals all year (and in any space) thanks to some helpful grilling tools and tips from Pampered Chef’s Food and Trend Innovators, Jackie Blust and Tim Hagedorn. Small, portable grills are common enough, but the Indoor Outdoor Portable Grill also converts from classic charcoal to an efficient electric cooking surface. That means you can bring it indoors and use the electric settings when rain threatens to cancel your Friday night fajitas cookout. You can grill right on your kitchen counter. When you grill indoors using the electric grill option, smoke can be an issue…but Jackie says there are two things you can do. 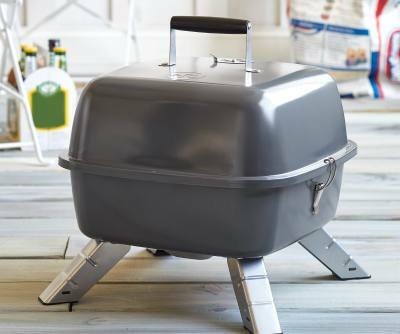 The Indoor Outdoor Portable Grill is perfectly designed to partner with Pampered Chef’s exclusive line of clay cookware for even more grilling options. The Rockcrok® Casserole, Everyday Pan, and Dutch Oven can now cook on location. Think stews and chilies in the parking lot before the big game! Or use the Small Grill Stone to grill breakfast sausages and scrambled eggs at your campsite. The list of tools you need to grill is pretty simple—and Pampered Chef has all the necessities. Our grilling tools feature stainless-steel design and pakkawood handles, a plastic/wood composite that has the look and feel of wood without the splitting and warping that can happen with regular wooden handles. Craving grilled foods on a rainy day? Turn your stovetop into a grill with the Grill Pan and a press. It can take the heat and creates beautiful seared foods. Plus, the ridges keep the food out of its drippings. If you want to flip burgers for a bigger group, the Double Burner Grill Pan holds up to eight at once. Place food on the grill pan at a 45-degree angle to the ridges for about 2–3 minutes. Rotate 90 degrees with the same side down on the grill pan. The ridges should run at a 45-degree angle in the opposite direction. Grill for another 2–3 minutes. No need to make grill marks on the other side, since it will be face down on the plate! Let’s flip our grill lids to convenient grilling wherever and whenever you want! Evdry thing I’ve ever gotten from PC has lasted forever. I sold PC years ago and love the products. I have so many wonderful recipes as well like Holiday Wrappings. 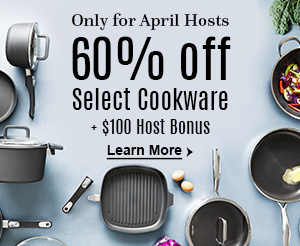 Love all things Pampered Chef.